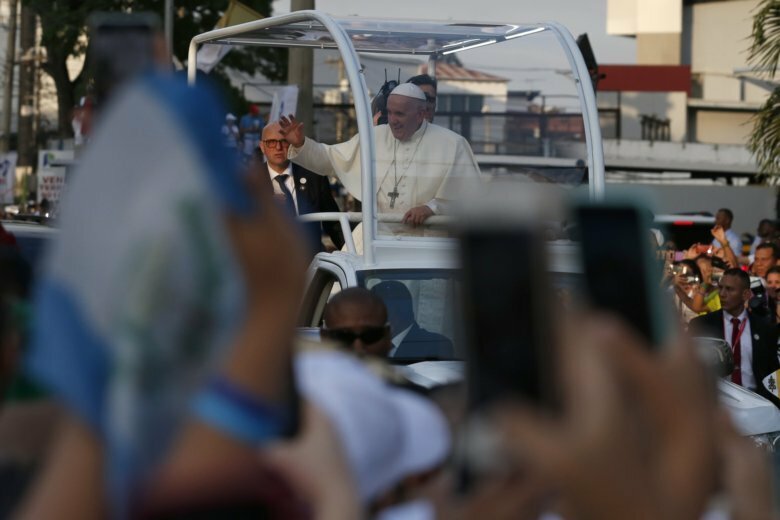 PANAMA CITY (AP) — Pope Francis insisted Thursday that public officials live simply, honestly and transparently as he opened a visit to a Central America that has been rife with corruption scandals and is now coping with political upheaval in nearby Venezuela. Francis stuck to his script in Panama, celebrating the country’s place as bridge between oceans and cultures and holding up the region’s newest saint, slain Salvadoran Archbishop Oscar Romero, as a model for a humble church that accompanies the poor. He welcomed tens of thousands of young people to World Youth Day, the Catholic Church’s big youth rally, and urged them to be builders of bridges of encounter, not “builders of walls that sow fear and look to divide and box people in,” a clear reference to the proposed U.S.-Mexico border wall. But he warned that those same young people are increasingly demanding that public officials live lives that are coherent with the jobs entrusted to them, and build a “culture of greater transparency” between the public and private sectors. Transparency International estimates that as much as 1 percent of Panama’s GDP, approximately US$600 million, may have been lost to various corruption schemes during the presidency of Ricardo Martinelli, who governed Panama from 2009 to 2014. Martinelli was extradited to Panama last year from the United States to face political espionage and embezzlement charges. In addition, two of Martinelli’s sons have been detained in the U.S. and are being sought on corruption charges in Panama. They are suspected of receiving more than $50 million in “undue payments” from Brazilian construction giant Odebrecht, which is at the center of one of the largest graft scandals in history. Odebrecht has acknowledged paying nearly $800 million dollars in bribes in a dozen Latin American nations in return for favors and works contracts. That includes at least $59 million in Panama, although authorities say the real figure is likely much higher. In addition to the Martinelli sons, the scandal has already implicated former government ministers under the elder Martinelli as well as people linked to the party of the current president, Varela. The Martinelli family has denied involvement by the sons in the bribery scandal and alleges persecution by political foes. The former president also denies any wrongdoing and says he is being targeted politically. Francis’ visit is taking place against the backdrop of both the turmoil in Venezuela and the ongoing migrant standoff in the United States, where the government is partly shut down over President Donald Trump’s demand for congressional funding for a wall at the U.S.-Mexico border. History’s first Latin American pope, who was born to Italian immigrants to Argentina, has made the plight of migrants a cornerstone of his papacy and denounced how fear of migrants was driving populist and nationalist sentiment across the globe. Speaking Thursday to Central American bishops, Francis urged church institutions from dioceses down to individual parishes to welcome and integrate migrants and serve as models for the rest of society to overcome fears of foreigners. And he urged them to look to Romero as inspiration for being a humble church that listens to the poor and accompanies them as a father accompanies his children. Francis has frequently urged young people to resist easy temptations of drug dealing and gang membership, and to especially avoid the lure of corruption. It is a message that will likely resonate with the youth of the region. Transparency International’s latest index of perceived corruption ranks the entire Central American region poorly, with the exception of Costa Rica. Panama ranked 96 out of 180 countries surveyed globally in 2017, better than many in the region including Nicaragua, El Salvador, Honduras and Guatemala, but still far from clean. In Guatemala, President Jimmy Morales has hamstrung the U.N.-sponsored International Commission against Impunity in Guatemala, which has pushed many high-profile investigations that have swept up politicians, public officials and businesspeople during its decade-plus of existence. In El Salvador, former President Mauricio Funes is wanted for alleged corruption and is currently a fugitive granted asylum with several family members in Nicaragua. Another ex-president, Tony Saca, was sentenced in September to 10 years for embezzlement and money laundering. In Honduras, former President Porfirio Lobo’s wife has been suspected of diverting $700,000 in public funds and his brother accused of pocketing about $300,000 in government money. His son Fabio was sentenced in the United States to 24 years for drug trafficking. Associated Press writer Peter Orsi contributed from Mexico City.